Students need to know their fractions, so they can solve more difficult mathematical problems in the future. With Gynzy, you can use your interactive whiteboard to make this process easier and more fun! 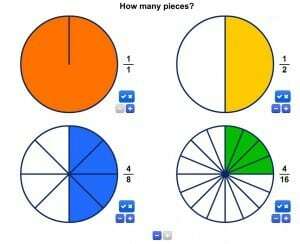 Make the fractions visual with the ‘All about Fractions’ activity. At the top of your interactive whiteboard a blue box will be shown. That blue square is 1 whole number. The fractions are situated at the bottom of the screen. Let the students select a fraction and drag it to the blue square. This lets students experience what fractions are and nicely visualize how many fractions fit in 1 whole number. Check if the students understand the concept with Fraction Bars and Circles. Use the combined fractions bar and circle tool to show the students the numerical representation of the fraction with the visualization of a fraction bar and circle. Repeat this until the students understand the concept. For repetition or review on the fraction bar or circle, you can also use the Fraction bars and Fraction circle tool separately. The Fraction Bars tool offers you the possibility to divide the fraction bar into different amount of fractions. Fill the amount of fractions you want with a solid color. Let the students answer what fraction the bar represents. You can press the ‘check’ button on the right hand side of the bar to display the numerical representation of the fraction. 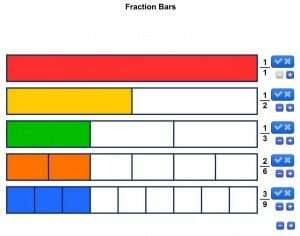 Add some more fraction bars to show differences between several fractions. The Fraction Circle tool works in the same manner, but obviously with a circle instead of a bar. The last representation of fractions is the fraction number line. The number line from 0 to 1 is presented on the interactive whiteboard. You can select the slices via “settings” to slice the line into equal parts. The tool offers you the possibility to show and hide the numerical representation of the fractions. Ask the students what fraction is represented on the position you indicate and show them the answer afterwards. Now that the students understand the concept of fractions, you can go deeper into the size of fractions. Which fraction is bigger, smaller, or are they equal? 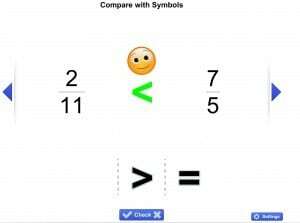 The ‘Compare with symbols’ activity presents two fractions on your interactive whiteboard. Let the student drag the correct symbol of comparison to the position between the two numbers. You will be shown you a happy smiley face if the answer is correct. If it is wrong, the student can give it another try. Play ‘Fractions Memory’! Make two teams, the blue team and the orange team. All the cards with the fractions are shown face down on the smart board screen. Each team has a chance to turn-over two cards. Press the cards to do so. If the cards represent the same fraction they will be added to the area on the right of the screen. You can play again. If the cards are not the same, they will be turned back automatically. The team with the most cards at the end wins the game!